A short mid-week respite from the cold pattern prevailed on Thursday (Jan 14), pushing daytime high temperatures well above normal for mid January, even mid 30s F at some locations. But even colder air awaits for the forthcoming days, as temperatures for the MLK long weekend and early next week may fall 15-20 degrees F colder than normal. Most models are pointing to warmer than normal conditions once again prevailing for the last 10 days of January, so the cold spell may be relatively short-lived. Registration is still open for the 3rd Annual Minnesota Climate Adaptation Conference on January 28, 2016 at the Hilton DoubleTree in north Minneapolis. This conference is designed for local officials, planners, engineers, natural resource practitioners and others who want to learn more about adaptation strategies that have worked or are being tested in various sectors, tribal communities, energy, local foods, emergency management, communication and water resources. At the conference we will also hear from several major corporations about how they are addressing climate adaptation and listen to a mayors’ panel at lunch where they will discuss city approaches to climate adaptation. The Minnesota State Climatology Office has resumed and published an update on the "Winter Misery Index (WMI)" for the Twin Cities. The WMI factors in colder than normal temperatures, accumulating snowfall, and snow depth as the season progresses. So far this winter the WMI has accumulated only 14 points on this scale, a very modest number. Last winter's WMI was a total of 55 points and the winter before (2013-2014) totaled 207 points, one of the highest values historically. 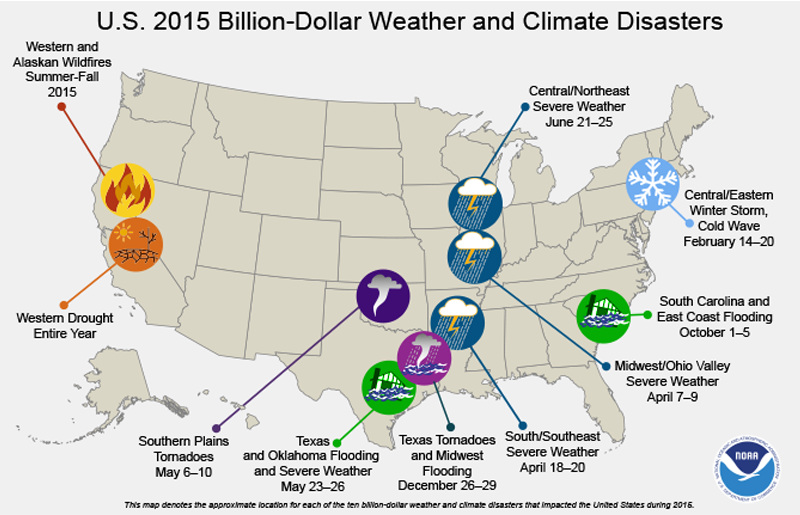 NOAA's National Climatic Data Center recently released a climate summary for the past year, 2015. 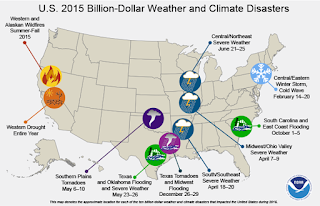 Their report also highlights 10 weather/climate disasters that resulted in at least $1 billion losses. Much of this was due to the wildfires and drought in the western states and tornadoes and flooding in the southern plains states. Multiple federal, state, and regional agencies are sponsoring the "Midwest Climate Outlook and Drought Early Warning System Kickoff Meeting" over February 9-11, 2016 in St. Louis, MO. This meeting is intended for water and land resource managers to share data analysis, plan, and development approaches for dealing with expected drought or other climate anomalies that may be expected in 2016. Registration is now open for the Minnesota Governors Water Summit, which will take place on Saturday, February 27, 2016. The summit will focus public attention on the serious challenges facing Minnesotas water supplies in both rural and urban areas of the state and continue statewide dialogue around steps that must be taken to address those challenges. The summit will bring together water quality experts, farmers, legislators, regulators, the business community, members of the public, local leaders, and a wide variety of other stakeholders. The Washington Post featured a story this week about Richard Hendrickson, regarded as one of the nation's longest serving Cooperative Weather Observers. He passed away at the age of 103 years old on January 9, 2016. Mr. Hendrickson became an observer for the National Weather Service in 1930, making continuous daily observations from his poultry and dairy farm on Long Island, NY until his death. He compiled over 150,000 measurements and observations in his lifetime as a weather observer, over 85 years of record-keeping. His farm and weather station endured the famous 1938 hurricane which struck Long Island and did considerable damage, as well as drowning over 4000 of his farm chicks. This week Hurricane Alex formed in the North Atlantic Ocean, the first hurricane to form in that region of the world during the month of January since 1938. Its peak 85mph winds make it the strongest Atlantic hurricane to form in the month of January as well. The storm is expected to bring rain, strong winds, and high seas to the Azores before dissipating late in the weekend. Meanwhile, in the South Pacific Ocean Basin tropical cyclone Victor was spinning and gaining strength about 300 miles east of Pago Pago, American Samoa. Winds were expected to exceed over 100 mph over the weekend, but this storm was not expected to be a threat to any land areas. In its weekly update NOAA's climate.gov web site posted an interesting article about “climate change impacts on the beer industry.” Certainly climate and climate change has great impact on the ingredients used in the brewing industry, but also on the storage, transportation, and marketing aspects as well. Which areas of the state have received the most snowfall so far this winter? It seems like we have been in a snow drought. Incidentally climate outlook models for the balance of winter continue to indicate expected less than normal snowfall for Minnesota. MSP weather records for this date include: highest daily maximum temperature of 43 degrees F in 1990; lowest daily maximum temperature of -20 degrees F in 1888: lowest daily minimum temperature is -37 degrees F in 1888; highest daily minimum temperature of 33 F in 1973 and 1980; record precipitation of 0.45 inches 1969; and record snowfall of 3.2 inches in 1953. Average dew point for January 15th is 4 degrees F, with a maximum of 36 degrees F in 1949 and a minimum of -39 degrees F in 1972. The state record high temperature for this date is 57 degrees F at Winnebago (Faribault County) in 1914. The state record low temperature for this date is -53 degrees F at Moose Lake (Carlton County) in 1972. State record precipitation for this date is 1.28 inches at Campbell (Wilkin County) in 1952; and record snowfall is 20.0 inches at Winsted (McLeod County) in 1969. By far the warmest January 15th in state history occurred in 1914 when many observers around the state reported afternoon temperatures in the 40s F. Ten Minnesota communities recorded a high temperature of 50°F or greater that day, only to fall to below zero F values the next week. In both 1952 and 1953 mid-January brought winter storms to Minnesota, delivering a mixture of freezing rain, sleet, and snow. Trees and power lines were damaged by thick coatings of ice. Schools were postponed or dismissed early. Some roads were close as numerous accidents occurred, some provoked by high winds that blew cars off the roads. Mid-January of 1972 brought Arctic cold to Minnesota. Over 50 communities reported a morning low temperature of -40°F or colder. For many areas the daytime high temperature never rose above -20°F. Much colder over the weekend with dangerous wind chill values ranging from -20 to -40 degrees F. In many areas temperatures will remain below zero degrees F. Continued cold next week, with some moderation in temperature by Wednesday.